Subject: Black Labrador Retriever losing hair on the top of her feet and spots around her mouth - part I. My lab is 11 months old and for the last month, she has been chewing and licking at her feet to the point the hair is gone on the tops of her feet. She also has a couple spots around her mouth that are the same way. She seems fine, plays, has good appetite, but this does bother her. Any suggestions? How are you? Thank you for your e-mail. My apologies on the delay, as I was a little behind with all the questions received. Yes, I do have a couple of suggestions, but first I do need you to provide me with some further information. Please answer the following questions for me. Is there any raw, irritated skin or open sores in these areas? Is she chewing on just one paw, or all four? What are you feeding her? Be Specific - include dog food brand and flavor, dog treats name and flavor, and anything else you might feed her. Do the areas have circular patches that are red and crusty? If you answered no to the last question: Is there any shape to the areas of hair loss? Do you notice any greasy, foul-smelling fur? Any problems with her eyes, ears or nose? If so, please let me know what kind of problem(s) it is. With all the email questions I receive, I always ask a favor of the person writing. If you have any photos of your Labrador Retriever, that you could email me, I would love to post them to the Labrador Retriever Pictures blog. You DO NOT have to send a photo to receive an answer to your question. If you do send a photo, and would like any caption to appear under the photo (Ex: Fido eating the garbage, my trip to the beach, dressed up for Christmas, etc.) make sure you let me know. Back in July of this year we posted an offer for a Free 7 oz. sample of Eukanuba Naturally Wild dog food (which has expired). Eukanuba is now offering a chance for you to join Club Wild. By joining Club Wild you can save up to $30 on Eukanuba Naturally Wild, featuring the protein sources dogs instinctively crave. The Club Wild coupon book consists of six (6) coupons for $5 each. For Your Information - The offer is limited to U.S. residents and there is a limit one Club Wild coupon book per household. Offer good while supplies last. This is a nice savings for those of you that feed your Labrador Retriever(s) Eukanuba Naturally Wild. Hope this helps. Hello to everyone, I hope all is well and everyone is enjoying their day. I'm answering questions sent in as best as I can. Sorry I can't answer all of you as there is just to many questions submitted. Please make sure you search the All About Labradors blog for you will might find the answer to your question. For those of you that have a new Labrador Retriever puppy (ahhh...how cute) or for those that will be bringing a new Labrador Retriever puppy (congratulations!) home soon, Eukanuba has some help for you. Right now, Eukanuba is offering a free Puppy Training DVD Kit that will take the challenge out of raising a well-trained puppy. The DVD, which is hosted by actor Jim Piddock (Best in Show) and dog expert Martin Deeley, will show you techniques on crate training, socializing, feeding properly and more. Puppy Training DVD - to help start your puppy on the road to greatness. $5 coupon - for Eukanuba premium nutrition. Quick guide - track your puppies health and how Eukanuba's formulas can benefit your puppy throughout his (or her) life. FYI: You’ll also get their bi-weekly newsletters filled with helpful puppy tips and advice. You can view a sample newsletter on their website. The offer is limited to U.S. residents and limited to one per household. Offer good while supplies last. This product I just recently came across and it my be a very helpful deterrent for licking and biting of hot spots, lick granulomas and surgical sites on your Labrador Retriever. Information from Nurtured Pets website - "Quote From Site: "Clinical studies show the Anti-Lick Strip to be over 90% successful at deterring licking, biting and chewing. Veterinarians agree that the Anti-Lick Strip pet bandage promotes healing of post-surgical sites, hot spots, lick granulomas or wounds. A good alternative to the E-Collar. Your pet deserves the best, especially when they are recovering from an injury, cut or surgery. The proprietary Anti-Lick Strip Pet Bandage is more comfortable and healthier choice for your pets recovery. No need for dog E-collars/ Elizabethan cones which can obstruct your pet from being comfortable." I have yet to try this product and hope I never have the need to, so I can't provide you with any personal experience with the product. Also, be advised at this time samples of Nurtured Pets Anti-Lick Strips are only be shipped to locations within the USA. If you have problems with the above link, visit nurturedpets.com and click on the "Free Samples" link in top left corner of website. If anyone does have any information from personal use of this product, please share your experience. Thank you! A Labrador Retriever Running for Mayor? I was also surprised to learn that in 2004, a black Labrador Retriever named Junior Cochran took office in Kentucky, after 'fetching' over 3,000 votes. The only sad part of both stories is that the lovable Junior Cochran did pass away on May 17, 2008 at the age of twelve. I'm sure Junior is now the beloved mayor over at the Rainbow Bridge. I do want to thank Danielle for sending this story in, it's greatly appreciated. Now I'm truly convinced our Labrador Retriever can accomplish anything. Maybe the next step will be a run for President. Snausages is promoting their new Sausages Snawsomes dog snacks. If your one of the first 50,000 to register, you will receive a FREE sample of Sausages Snawsomes dog snacks. Information from Snausages - "These soft and chewy treats blend delicious peanut butter and apple for a twisted good time." Click the "Free Sausages Snawsomes Dog Snack" link in left bottom corner of their website. FYI: "Open to legal residents of the 50 U.S. & D.C., 18 or older who have a valid email address. Between 9:00:00 AM Central Time ("CT") 8/17/08 & 11:59:59 PM CT 10/31/08 or while supplies last, whichever is sooner. The first 50,000 eligible individuals to submit a valid request, as determined by Del Monte Foods in its sole discretion, will be sent one (1) coupon via U.S. mail for one (1) free package of Snausages® SnawSomes!® Peanut Butter and Apple dog snacks. Limit of one (1) coupon per household. " You will receive a message letting you know if your one of the first 50,000 after you submit the registration form. A big thank you to my sister-in-law, Fay over at Freebie Fanatics for letting me know about this one. Chucky never had fleas, at least none that I nor the Vet noticed. But he started him on K9 Advantix, also Simplicef as an antibiotic and Hydroxyzine for the itching. My Vet did a skin scraping, D.T.M. culture, and a dermatological evaluation. We got him as a puppy, around 9 weeks old, and yes he always had a problem with his skin. The sores came around two weeks ago, and are clearing up very well. He is still taking Meds. The Hydroxyzine helped but he mainly itches his neck area under his ears, back legs and back. Yes, he some times chews and licks his front paws. I regularly clean his ears because of build up. No, his odor is not strong. We bring him inside some times, he is pretty clean. Yes, circular patches and hairloss, they clear up and come back. He is free of them right now. I feed him Hills Science Diet large breed adult. No table scraps, As treats Dentleys Rawhide twists. Other than his skin, he is perfect. Thank you for the wonderful photo of Chucky, and for the response to the questions I asked. Skin infections are some of the most frequently treated problems by veterinarians. Bacterial skin infections, which is what Simplicef (cefpodoxime proxetil) is being used for, can cause sores to appear on your Labrador Retriever. Excessive shedding, patchy loss of hair, and scaling can also develop as a result of bacterial skin infections. In most cases skin infections are secondary to another problem (allergies, parasitic infections, hormonal abnormalities), so it is important to determine an underlying cause to keep infections from reappearing. Besides the antibiotics Chucky is taking, topical therapy can include the use of shampoos containing Benzoyl Peroxide (Pyoben®, Oxydex® shampoo). Shampoos containing Chlorhexidine can also be used. You stated that Chucky gets circular patches and hair loss, which could be a symptom of ringworm, a skin disease caused by a fungus. Did you get the results of the ringworm test? Other symptoms to go along with the circular patches and hair loss can include scaly skin in the center of the lesion. A small inflamed elevation of the skin, filled with pus (pustules) may also be present in the lesion. These lesions do not always form a ring and can disappear as time goes on and then appear on other locations of the skin. Griseofulvin (an antifungal drug), topical antifungal medications, bathes using antifungal shampoos, lime sulfur dips and a possibility of shaving your Labrador's hair. As far as Chucky's chewing and licking of the paws, it may be a sign of allergies. Allergies to airborne particles (Inhalant allergies) such as pollen or house dust and to certain foods (food allergies) can often cause itchy paws. Contact allergies, when Chucky comes into contact with something he is sensitive to, can also cause itchy paws. The problem is figuring out what the allergen is. Skin and blood test can be done by your veterinarian, as well as setting up a special diet "hypoallergenic diet", for a possible food allergy. Some of the most common offenders in dogs are: beef, dairy products, chicken, wheat, chicken eggs, corn, and soy. If you take a look at your dog food bag label, you will probably see some of these listed. What is done for food allergies is a special diet (hypoallergenic diet) - a changing of his food to something he hasn't eaten before, which is fed for a set period of time (usually it takes at least 12 weeks on the new food) can be done to help to determine if this is the cause. No other treats should be given during the food trial. Only exception is if they are based on the same food sources as the test diet. No unnecessary medications are to be given. No edible chew toys (such as rawhides or bones) should be given. If you do decide to do a food trial and need help in recommending dog foods, let me know. With allergies, bathing and conditioning is also an important part of the treatment, as allergens do get absorbed through her skin. A nice cool bath can be helpful, since the water will help assist in relieving the itching. You can add a little colloidal oatmeal (Aveeno) to the bathwater, which will help to soothe, or your veterinarian, can prescribe an antiseptic shampoo. Make sure you rinse thoroughly after the bath, since any remaining soap that remains can make the itching worse. Hypoallergenic shampoo - is soothing and can provide temporary relief to inflamed skin. Witch hazel has a cooling effect on the skin which will be soothing for her paw. Aloe Vera gel (my personal favorite) - if possible, obtain 100% Aloe Vera gel from a health food store, not the mixture, as the mixture is not as effective as the pure aloe. The pure aloe gel from the aloe plant contains enzymes which will help with the inflammation, and help in the healing process. The thing I like is that the pure Aloe Vera gel is not harmful for pets who want to lick it off. I recommend supplementation with the essential fatty acids to all Labrador Retriever owners, as they are necessary for the development of healthy skin and coats. Please keep me informed of Chucky's condition and if you try anything that I've mentioned above. I hope this will be of some help to you and Chucky. If you don't understand anything or have other questions, please e-mail me. Ackerman, L.: Guide To Skin and Haircoat Problems in Dogs. Alpine Publishing, 1994: 7-19. Hello, my name is John and I have a beautiful 2 year old male Black Lab who has always had skin problems. He is an American Labrador named Charles, ( Chucky ). It has gotten worse in the last few months, he has developed sores on his head and front paws. He was chewing on his tail and the area at the base of his tail. The Vet fixed the problem with the tail and the hair grew back. Now he has these little sores sprinkled around his body. He is on antibiotics and allergy meds. His skin has always been flaky and now more than ever. His hair on his back comes out real easy. The Vet ran some test and he does not have mange, now he is being tested for ring worm. It may sound like my doggie is hideous but he is not. I know my Chucky is very uncomfortable and need help determining what his condition is. Thank you for visiting All About Labradors blog. I'm sorry to hear about Charles condition. Please answer the below questions, as I need some further information to try to be of help to you. What kind of testing did your veterinarian do for mange? He's had skin problems since birth? How long has he had the sores, and when did it start developing? Is there itching going on? If so, where? Any licking of his paws going on? Any problems with his ears? Does Charles have a strong odor to his coat? Any circular patches of hair loss? What do you feed him - food - include name brand and flavor of food, treats - name brand and flavor, any table scrapes? Any other conditions you can tell me about - weight gain, weight loss, lack of energy, etc. Get back to me with the answers to these questions and we will continue from there. This offer is for a free Febreze Pet Pal Pack for anyone that had recently adopted a dog. Information from Dogster - "Have you recently adopted a pet? Febreze is now sponsoring the Dogster Adoption Center and is offering a free pack of goodies for new pet owners. The exclusive, limited edition Pet Pal Pack will come complete with a collapsible pet bowl, handy food scoop, food clip and Febreze Pet Odor Eliminator coupons, good for the entire line." You must register at Dogster, confirm your e-mail, add your dog's information AND a photo of your dog to be eligible for this one. Free Febreeze Pet Pal Pack . 1/4 of the way down the page you will see the offer. After you have registered and added all the necessary information, click back on the above link on this page, scroll down to the offer and click "Register for the Febreze Pet Pal Pack". You will then see the form to make your request for the Febreeze Pet Pal Pack. For those of you that use Iams or want to try Iams, you can request a coupon for a free bag of Iams Premium Protection dog food. Click Iams Premium Protection to learn more about their product. Free bag of Iams Premium Protection Dog Food. This offer is for the USA only and limited to one per household. I did notice on the offer page it states "All coupons sent via email" but after sending the form, my confirmation page stated "You will receive your coupon for a free bag in the mail within 1 week". I haven't received it in my e-mail, so I'm assuming this gets sent in the mail. They also offer I free coupon for Iams cat food. 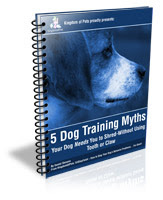 Here is a 26 page FREE ebook titled “5 Dog Training Myths” written by dog training expert Daniel Stevens. Feel free to print this ebook out on your computer printer or you can e-mail to a friend. Click iPaper at the top of the ebook to print and/or e-mail. You can also download a copy of this ebook by clicking on the word Scibd at the top of the ebook. You will have to register at Scrib, but it's an easy registration and you can find many other helpful ebooks and documents there. If anyone would like me to e-mail them a copy of 5 Dog Training Myths ebook, just click the "Contact Me" link on the top left sidebar of this blog.